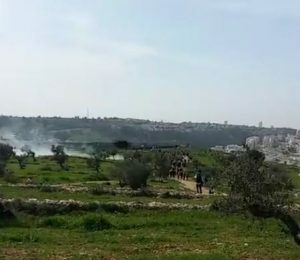 On Friday, dozens of Palestinians, accompanied by Israeli and international peace activists, marched in Bil’in village, west of the central West Bank city of Ramallah, marking the fifteenth anniversary of ongoing popular nonviolent resistance against the illegal Israeli Annexation Wall and colonies, before the soldiers resorted to the excessive use of force, injured five, dragged and abducted an international peace activist. Many Palestinians from various areas of the occupied West Bank, including heads and members of local councils, senior political leaders, in addition to current and former ambassadors, also participated in the nonviolent procession. They all marched chanting for liberty and independence, affirming the Palestinian internationally-guaranteed rights, and calling for establishing a Palestinian state with Jerusalem as its capital, in addition to denouncing the illegal American stances and recognition of the occupied city as the unified capital of Israel. The nonviolent protesters also carried Palestinian flags, and a large stereoscopic figure of the number 13, decorated with pictures representing thirteen years of ongoing struggle, and attached to it spent gas bombs. 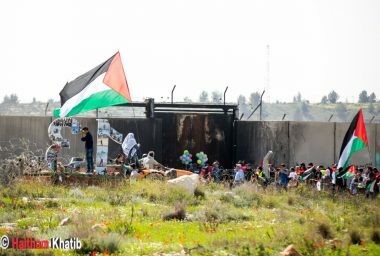 Some protesters dressed like native Americans, representing the displacement and massacres against the indigenous population, and others dressed like Avatar characters, while many children carried balloons with pictures of Palestinians who were killed by the army during nonviolent processions, and those who were abducted and imprisoned, including ‘Ahed Tamimi and Monther Amira, before the balloons were released to fly freely in the air. They also chanted for national unity, the liberation of Palestinian, including its occupied capital, Jerusalem, in addition to calling for the release of all political prisoners. 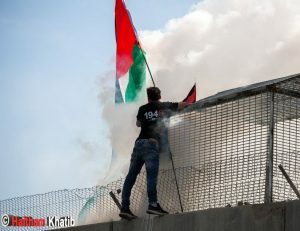 Upon reaching the gate of the annexation wall, some protesters wrote graffiti, while others started banging at the gate with stones and raised Palestinian flags. The soldiers filmed the nonviolent protesters and resorted to the excessive use of force against them, before firing live round, rubber-coated steel bullets, gas bombs and concussion grenades, and attacked many of them. 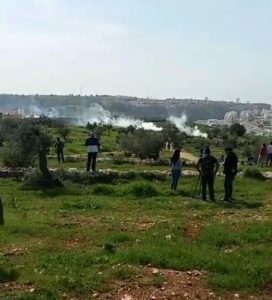 The Popular Committee against the Annexation Wall and Colonies in Bil’in, said the soldiers shot five Palestinians, including cameraman Issam Rimawi, who was shot with a rubber-coated steel bullet in his arm. One Palestinian was shot with a rubber-coated steel bullet in his shoulder, while resident Bassam Yassin, was shot with a gas bomb in his leg, in addition to Adeeb Abu Rahma, who was shot with a gas bomb in the head, and dozens of others suffered the effects of teargas inhalation.